Undersea pipelines are strategic infrastructures with economic and geopolitical significance. Protecting andsecuring oil and gas ducts is crucial to secure strategic assets. The Italian peninsula connects Europe to North Africa. The country is strategically positioned and potentially a natural “hub” for oil and gas distribution across the Mediterranean. The national economy may highly benefit from such a development inherently both internal energy consumption and development of the Oil & Gas industry. Plus, Italy can boast an internationally recognized specific know-how in the Oil & Gas, with leading worldwide players. At the same time, the fame of such corporate actors overshadows the centrality of smaller companies that have a crucial impact on such strategic infrastructures that need to be constantly secured and protected, especially when running undersea. Officine Maccaferri has by now a consolidated experience and is acknowledged as a key player on the global stage – within the Oil & Gas value chain – when it comes to maintenance and protection of pipes that hold both an economic and geopolitical significance. 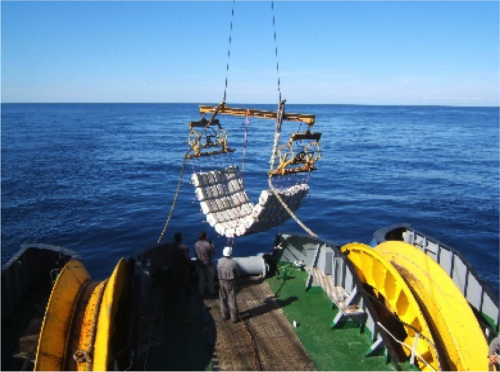 An example of Maccaferri’s leadership in this context is the securing – realized with SARMAC mattresses – of the Greenstream pipeline. Developed by Saipem and operated by Eni, Greenstream connects the refining facilities in Mellitah to Gela (Sicily). In Mellitah, two gas flows converge: the first coming from the Bahr-Essalam field (110 km offshore), the second from Wafa, inland location close to the boundary with Algeria. In Mellitah, methane gas is refined and successively rerouted for local consumption and export to Italy by a 32”, 520 km pipeline, the longest in the Mediterranean Sea. Several parts of the track needed intervention in order to secure the strategic infrastructure from undersea hydraulic forces. SARMAC bituminous mattresses proved to be the most efficient solution in order to create a protective shell and separate pipes at intersections. For the purpose, 729 5×2.35×0.30 mt. mattresses were implemented. Years after our intervention, the pipeline is safe and operational. Click here to read more on our detailed Case History.